Do You Know About Our Practice? Meet Our Team! The skilled, friendly periodontal professionals at Central Florida Periodontics & Implantology work with you to provide you with cutting-edge options proven to improve your dental health. Meet the team that’s behind creating beautiful smiles! From start to finish, the staff at Central Florida Periodontics & Implantology try to make your experience a pleasant one. To that end, Linda Jung is the first smiling face you’re likely to see at our practice. Linda Jung, the team coordinator at our practice, manages resources on-site and helps patients better understand their options. Linda ensures that everyone on the staff is on the same page and that patients can be seen as soon as possible. Linda can walk you through any new patient forms you may have to fill out if you’re having trouble understanding any terms or if you need to know, for instance, where to look for your medication history and possible allergies. As a team coordinator, Linda also helps patients schedule appointments, understand financing options, and arrange payments. She’ll go through the financial policy at Central Florida Periodontics & Implantology with you so that you’ll know what payment methods and insurance policies tend to work best. Cash, personal checks, and money orders are accepted and our practice accepts most forms of preferred provider organization (PPO) insurance. You might be surprised to see DMD after Dr. Sevor’s name…what is a DMD? DMD stands for a Doctor of Medicine in Dentistry (or Doctor of Dental Medicine), and Dr. Sevor helps patients treat their periodontal disease and provides a number of other dental, periodontal, and implant procedures. Dr. Sevor achieved his Doctor of Dental Medicine Degree from ADA-approved University of Alabama before undergoing periodontal specialty training at Louisiana State University. Dr. Sevor is board certified by the American Board of Periodontology and has years of training and experience performing: laser periodontal therapy, scaling and root planing (periodontics treatment), tooth restoration, gum reshaping procedures, bite adjustment procedures, and bone grafting. Another huge part of Dr. Sevor’s practice is bone grafting and installing durable titanium-based implants to qualified candidates. In fact, Dr. Sevor has achieved widespread acclaim for his dedication to providing long-lasting, durable dental implants. Dr. Sevor has lectured around the globe on the benefits of dental implants and evolving best practice in periodontics. 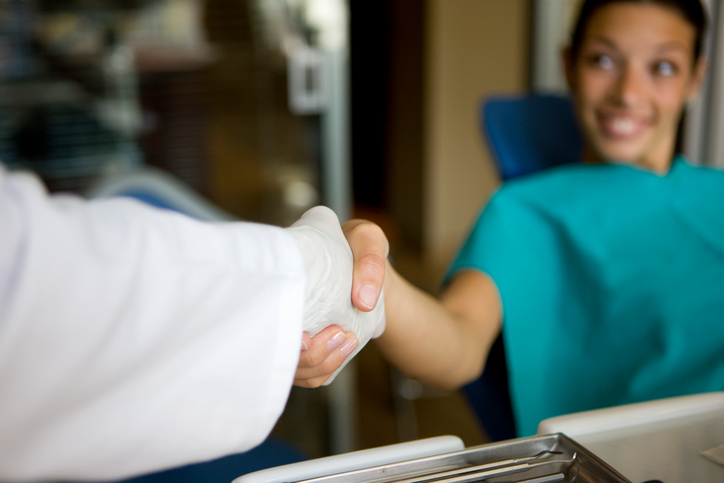 Every dental and periodontal practice needs a registered dental hygienist. David brings enthusiasm, skill, experience, and a friendly touch to the practice. His goal is to make every patient feel comfortable and cared for. David assists Dr. Sevor throughout periodontics treatment and provides a helping hand to Dr. Sevor as patients undergo cosmetic procedures or receive dental implants. As a registered dental hygienist, David has received training and has years of experience providing individualized hygiene assessments and leaving patients with dental home-care tips. David will clean and polish your teeth and has been known to go the extra mile to ensure that your visit to Central Florida Periodontics & Implantology is as enjoyable as possible. Renee’ and Marie make it their top priority to assist in any way they can as Dr. Sevor provides patients with state-of-the-art periodontal and implant care. Both Renee’ and Marie bring a level of compassion, skill, and knowledge to the practice that’s hard to find elsewhere. With Renee’s and Marie’s help, Dr. Sevor’s practice provides gum disease treatments and dental implants to patients in the Orlando, Florida area. A referral from a dentist for periodontics treatment is not required and IV sedation is available. Contact Dr. Sevor’s office today.